Simultaneously oppressive, terrifying, beautiful and spectacular. Aside from the lush, rugged regions to the south of Santiago, Chile is generally a harsh, barren country. We knew this before we arrived. Karl had spent unknown hours scoring virtual maps marking out potential surf breaks and spots to camp for the night. Despite all this preliminary research and experience in the harsh deserts of Australia, the Atacama desert both impressed and tested us. Driving through hundreds of kilometres of near straight roads with only rocky, sandy hills to look at was a strange sensation. At times it reminded us of of areas in Australia such as the Nullarbor which features Australia’s longest straight section of road. 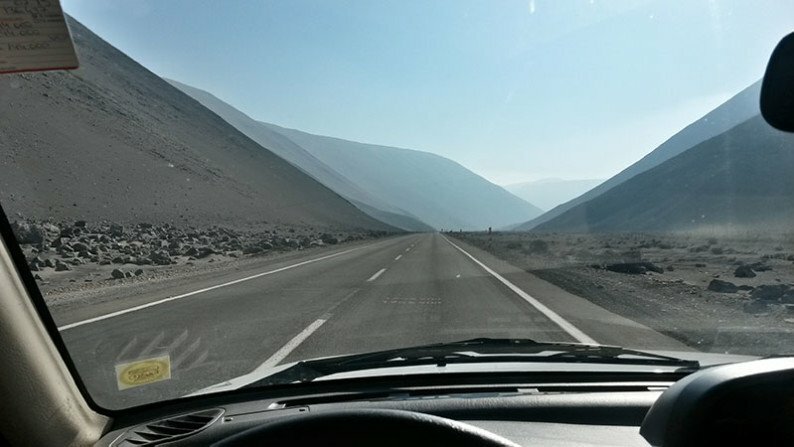 In some area of the Atacama it’s possible to drive an entire day without seeing a single form of life; not even a cactus! Just sand and rocks. Such an immense, barren and inhospitable desert such as the Atacama does have a raw energy and beauty to it. But even with a full tank of gas and a week’s worth of food and water we always felt insignificant and vulnerable. 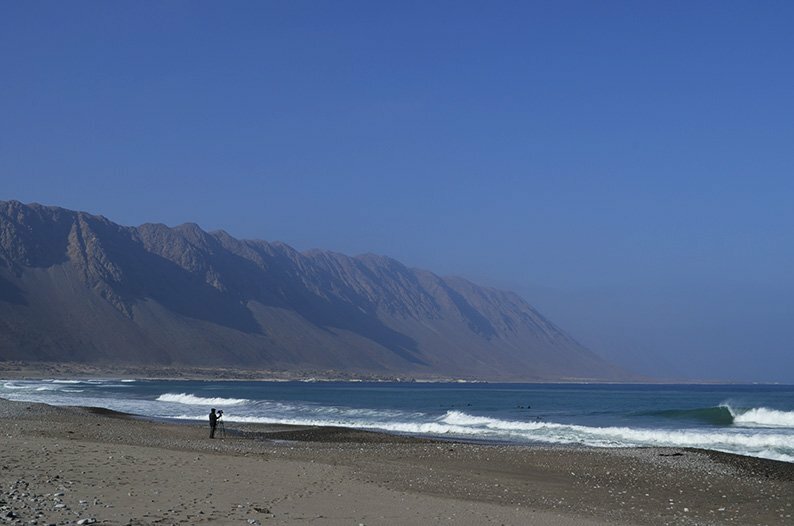 One late afternoon, at the mouth of the Rio Loa, located between Antofagasta and Iquique, we decided to drive up a sketchy looking 4×4 trail towards the river valley looking for a place to camp the night. Eventually we arrived at a dead end where the road turned into a 20m sheer drop off into the bleak, desolate valley. Rio Loa, the longest river in Chile, originates from high up in the Andes. By the time it meets the ocean it is generally nothing more than a small stream. Even with a source of fresh water there wasn’t much plant life. What did grow was harsh and scrubby to match it’s surrounding environment. The greenery was a welcome sight nonetheless, as it was the first time we’d seen any plant life that day. The cities of northern Chile are few and far between. Antofagasta, Iquique and Arica are the main cities, with smaller mining town towns and fishing villages scattered in between. 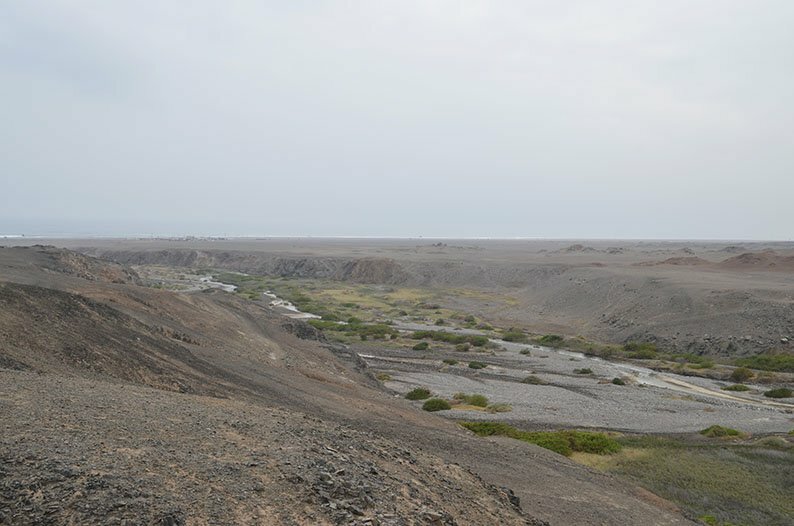 The old Ruta 1 between Taltal and Iquique (not continuous): Spectacular and dynamic coastal drive with fields of desert flows and misty, damp conditions during certain seasons. Barely any people, aside from the occasional fisherman’s shack. Lots of wild camping opportunities. The road is fairly good along the coast, however is does deteriorate at some points, especially as it angles east inland to reconnect to the main highway. 4WD will help along this section especially if there has been rain recently. Be warned the drive inland from the coast is slow going due to narrow, unsealed, winding roads. Rio Loa: Chile’s longest river and a tiny speck of green life in an otherwise desolate environment. Where the Loa meets the sea there is a fairly long, wide sandy beach which often offers up fun, peaky waves and offshore winds (due to the valley). With a 4WD vehicle it’s possible to drive on the beach right down to the shore, but be careful to follow existing tracks as there are boggy patches. There’s a customs checking point here as it’s gateway (on this road) to the Arica region. It was a bit confusing for us as we just drove through and no-one stopped us. One the way back we did stop and all we had to do was show our id paper, visa and the car’s documents. You can free camp on the beach, but it’s quite exposed to the wind. Alternatively a few km south of the river mouth there’s a number of large rocky outcrops with plenty of tracks and sheltered spots to camp overnight. There’s no fuel sold here, so bring plenty of your own. There is a small, cosy looking cafe and toilets at the border checkpoint. 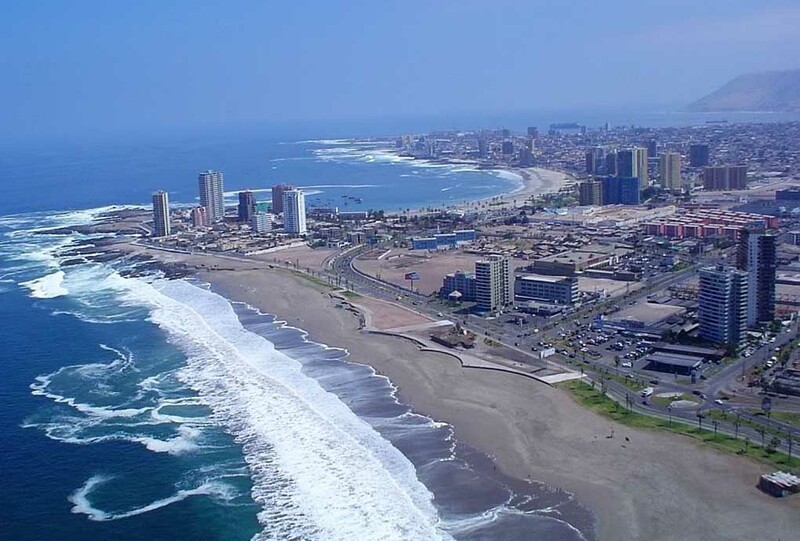 Iquique: Surprisingly vibrant and beautiful, with recently upgraded foreshore and park areas, plenty of surfing opportunities right in town, cafes, restaurants, large grocery and retail stores, and accommodation to suit all budgets. We stayed in Iquique for five days and really enjoyed being able to leave the car at the hostel and just walk 50m to the foreshore and surf some of the fun reef break waves with the locals. Free camping is challenging in town as people are fond of having BBQ and drinking alcohol at most beaches and lookouts anywhere near the city, no matter what day of the week it is. Arica: Our favourite coastal city in Chile. Our original plan was to stay in Arica for one week, however that was extended to two weeks as we struggled with Chilean-Peruvian border crossing dramas, getting international insurance, and obtaining an updated copy of our vehicle’s ‘padron’ (ownership paper). After a short stint in Bolivia, we returned to Arica and stayed there for another two weeks. Arica has a beautiful pedestrian mall, various ocean foreshore parks, a massive sandy beach, and a number of very consistent, high performance reef break waves. Mild weather all year around, however it is affected by the common phenomenon in desert areas of the South American west coast being overcast and gloomy conditions in the mornings (great for surfing though, as the winds are still and there’s no sun glare). Free camping is very limited in town, however there are a number of reasonably quiet coastal lookouts about 7km to the south of the city suitable for overnight stays. Expect some revelry on weekends or after football matches though, as some locals visit these spots to drink and listen to awful reggaeton music. San Pedro de Atacama and Valle de la Luna: Yes, this is a well established tourist/backpacker hub and for good reason. Whilst San Pedro town is a quaint, tourist friendly town with adobe style buildings, narrow alleys, cafes, restaurants, hotels/hostels and tour booking places the real magic is the spectacular, almost off-world landscapes surrounding it. 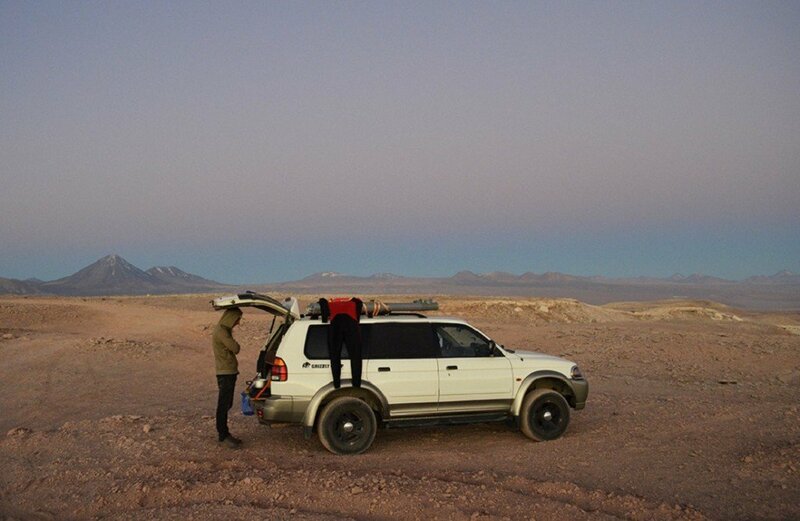 Every afternoon we always found a lookout area to watch the spectacular sunset colours and full moon rising over the Andes and windswept, martian valleys. Valle de la Luna is a few kilometres west of town and is very beautiful. To the north of the road that runs past the valley are numerous tracks which take you to perfect wild camping spots. Just be careful when driving at night as there are some sheer dropoffs into the valley below. Fuel is limited and expensive here. We recommend filling up in Calama if you are approaching from the coast. Lagunas Miscanti y Miñiques (Lake Miscanti and Miñiques): Located about 2-2.5 hours drive south of San Pedro. 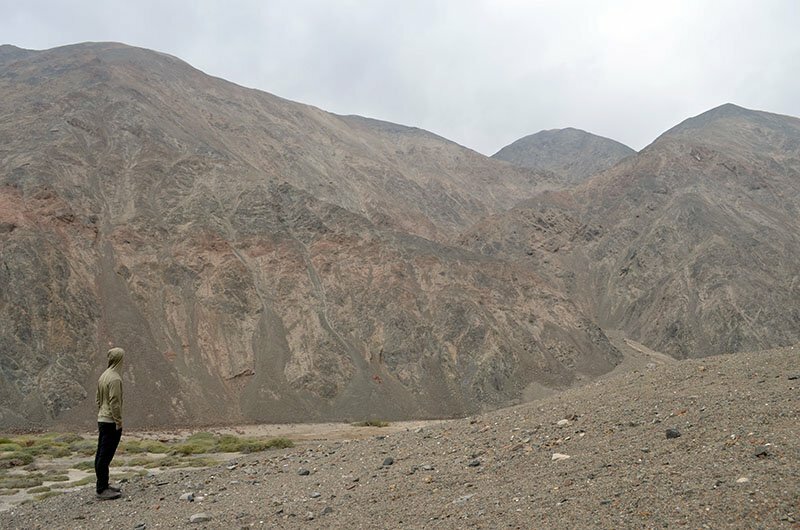 The highway is sealed and fairly straight, so it’s easy driving, however once you turn off into the park things deteriorate as you wind along a narrow, lumpy gravel track and compete for space with the numerous tourist vans. You will need to pay an entry fee to enter the park, even with a Chilean parks pass as it is owned/managed by the local indigenous people and is a source of funding and employment for them. 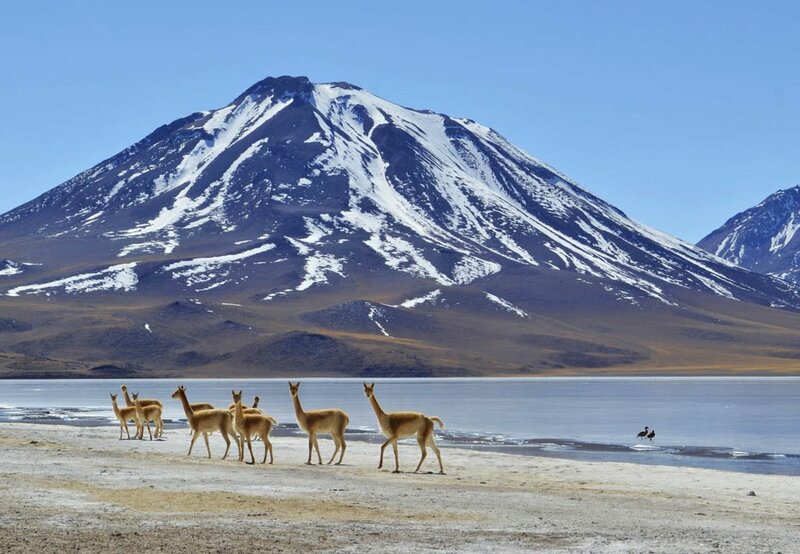 The Miscanti Lake is spectacular and often has herds of vicuñas hanging around. Free camping isn’t possible within the park, but there’s plenty of spots off the road to park overnight if needed. We decided to drive back to San Pedro the same day so we could watch the sunset over the Valle de Luna again. Puritama thermal baths: We’d stumbled upon a number of free thermal baths throughout remote areas of northern Chile, but the puritama baths were definitely some of the nicest and worth the access fee (about $20 each). It’s a boring, hour-long drive north of San Pedro and then a 10 minute walk from the parking area down into the valley. We were amazed at the tranquil, green oasis that could see as we descended into the valley and saw the stream and baths down below. The water is warm (25-30ºC), there’s a bunch of different levels, the water is crystal clear, and it was surprisingly quiet as we arrived there at 9am, well before the gringo tourist buses were due. We visited the thermal baths on our last day in the San Pedro region, just before we made the long drive back to Santiago, and it was well worth it! There’s plenty of spots to pull up and camp overnight, but the spot we found north of the Valle de la Luna was too tempting to not enjoy for one night more. 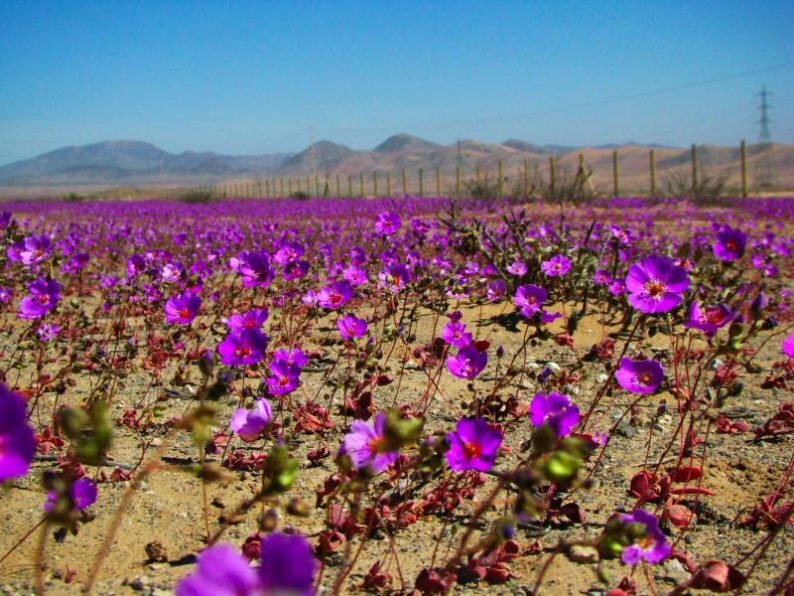 Atacama desert flower blooms: A rare event that occurs after rainfall in the desert. We missed this even by a matter of weeks which was disappointing because it’s known to be absolutely spectacular if you are lucky to be in the right place at the right time. 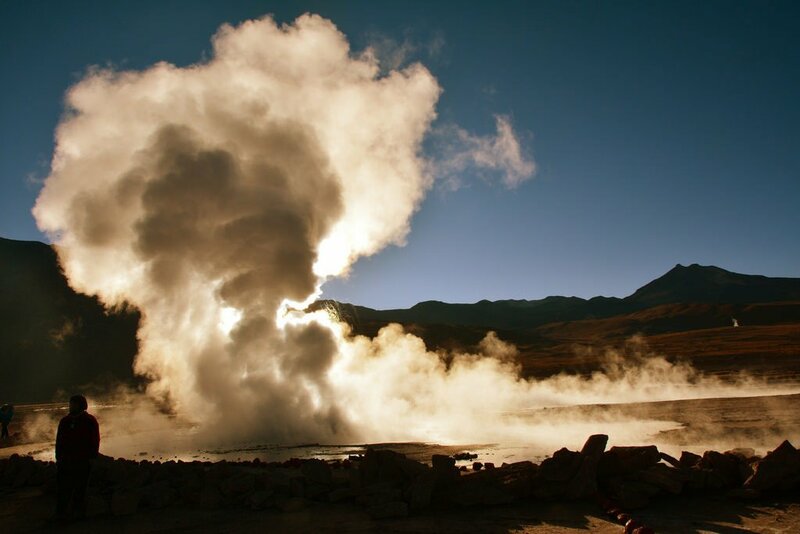 El Tatio Geysers: Located a couple of hours drive outside of San Pedro de Atacama these are the third largest geyser field in the world. We heard that it’s a somewhat surreal, eerie experience but you really need to be there at dawn. Be prepared for an early, freezing cold morning. We opted to explore other attractions in the region as we’ve seen similar while travelling in New Zealand. The Atacama is the driest non-polar desert in the world. Don’t risk it! Take with you at least 5L per person, per day. We carried 60L+ at all times when leaving the main road. Obtaining drinking water can be challenging. Generally tap water is safe in Chile. We refilled whenever and wherever we could, including at hostels, cafes and gas stations. Just ask the owner/attendant for potable water and they’ll help you out. The 5-10L plastic water jugs, as sold in grocery stores, are really handy for refilling water from hard to access spaces. 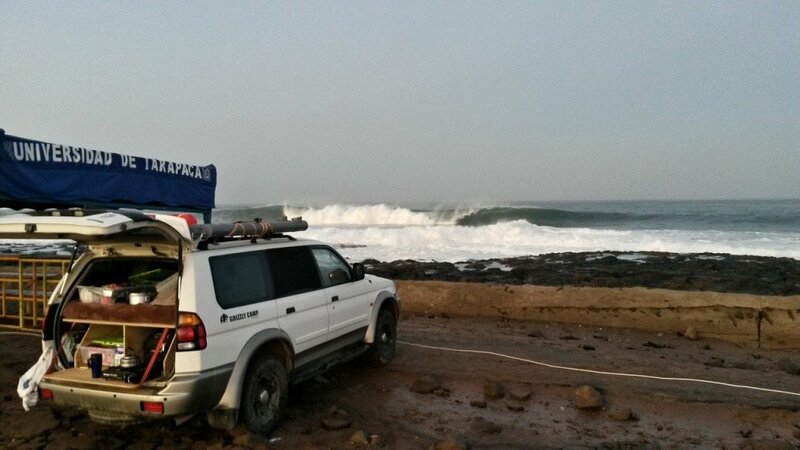 We travelled during winter to avoid crowds and maximise surfing opportunities. The weather along the coast is generally mild, being cool at night and warm during the day. However, as you head inland the difference in temperatures widens. Some days were over 35ºC. A few hours later, once the sun had dropped down, it would be below 0ºC. Bring suitable clothing and be prepared to add/remove layers throughout the day. Always refill at any opportunity you can, especially before going into the backcountry. We also carried an extra 20L fuel canister which saved us from getting stranded a number of times and was great peace of mind. Never leave any valuables inside your vehicle when unattended. Theft from vehicles is fairly common in Chile, especially if you look like a gringo tourist. People will notice you and your vehicle. To minimise risk we recommend to park in secure parking areas when possible and take your valuables with you at all times. Keep in mind that if you try parking overnight near a major town or city, there is a high likelihood that the secluded beach overlook you found is also a favourite haunt for locals to hang out, drink beer, talk loudly and blast horrible, repetitive reggaeton music all night, on any night of the week, once they’ve had their evening meal (10pm onwards). They also seem to be attracted to other vehicles, including your own, supposedly looking for friends to party with or strength in numbers so the Police won’t harass them. Either way, don’t be surprised if five other cars all parked up next to you even though there’s hundreds of metres of beach they could have parked instead. It’s all harmless, just bring earplugs! We managed to access a number of beautiful camping places thanks to the 4WD capabilities of our Montero Sport and our own prior experience with off road driving. Additionally, altitude sickness of varying degrees becomes a potential issue at altitudes above 2,400m for most people. 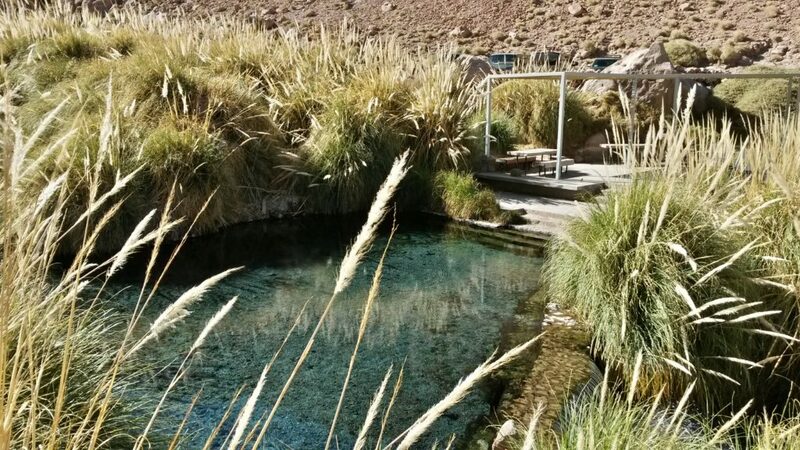 If you are planning to visit the altiplano regions of Chile which are often high altitude, it is recommended to ascend slowly over 24 hours (camp out somewhere at 1,500-1,800m) and allow a few days to acclimatise. We made the mistake of going from sea-level to 4,500m in two days. We paid the price for it the first night at that altitude. General altitude sickness feels like you’ve got a bad hangover, plus you’re constantly short of breath, and your limbs feel like they are ten times heavier than normal. Don’t underestimate it! You don’t want to get caught out in some remote area of the Atacama. Check out our guide article on how to buy a car in Chile as a foreign traveller. 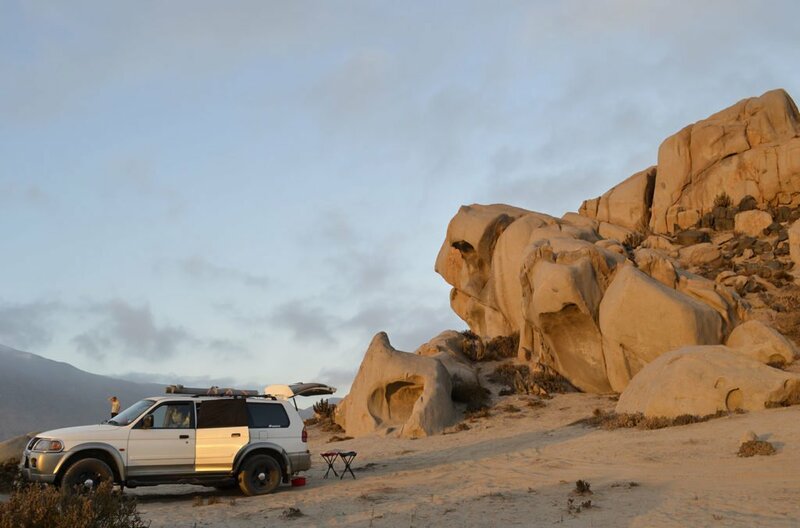 It’s also worth contacting some of the local vehicle conversion and sales companies in Santiago, such as Suzi Santiago, to see if they can hook you up with a decent vehicle and equipment ready to explore the vast expanse that is northern Chile. Questions or comments? Leave your thoughts below.